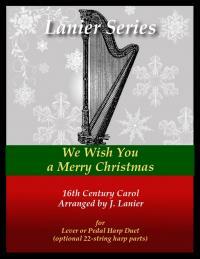 The Folk Harp Society has requested a harp duet version of my "We Wish You a Merry Christmas" arrangement for their journal. The harp 1 and 2 parts will be published in their Winter 2011 journal with information to download the full score and 22-string harp parts. Free PDFs are available for any of these parts by clicking on the attachments below. Enjoy spreading the joy of this great 16th C. carol!